This famous zoo is a great way to view animals in their natural habitat. The zoo's emphasis is on conservation and environmental concerns and is sure to keep adults and kids alike amused and interested all day. These caves are officially the oldest recognised dwelling in Britain. Take a stroll through the beautiful caverns and enjoy the same experience as your ancestors did, nearly half a million years ago. The Babbacombe Model Village contains over 400 models making up a miniature Westcountry, and with many special features throughout the year, it is a great place to spend a fun-filled afternoon, or a relaxing evening when the whole village is completely illuminated. Just a short drive from the Berryhead Hotel, you'll find the popular Victorian experience of Bygones. With a range of displays and interesting exhibits, taking you back in time to the sights and sounds of the Victorian age. Situated just outside of Exeter (just over 30 minutes drive), you can discover a theme park designed for the younger members of the family. With fun, smaller versions of rollercoasters, pirate ships and log flumes, indoor and outside play areas and picnic areas, Crealy makes for a fantastic day out. The replica of Sir Francis Drake's Golden Hind, gives a real sense of what life at sea really used to be like and portrays the sense of adventure to be hand living in the 16th century. A unique attraction with underwater views, taking you to the coastal habitats around the world. Situated on Beacon Quay, with spectacular views across the bay, it is a short walk away from Torquay's bustling marina. Journey along the beauty of the Torbay coastline to the banks of the river Dart, on this full size steam railway. 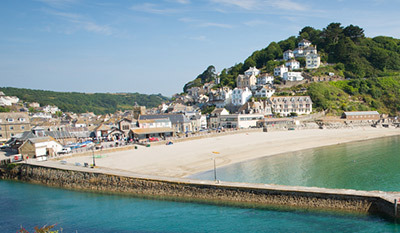 Enjoy a wonder around Dartmouth's picturesque town and waterfront, then a relaxing ride back on the steam train or a gentle journey around the coastline by ferry. The only outdoor water park to be found in Devon, and certainly the wettest fun to be had during your holiday! Choose from 8 of the flumes, catering for a wide range of age groups, with a separate swimming and paddling area. Torre Abbey is the oldest building in Torquay. It has a story spanning 800 years and was once the most important Abbey of its kind in England, the brothers who lived here then were known as the White Canons. Following a massive three-year restoration project visitors can now explore the most ancient and hallowed parts of the building where some stunning finds have been unearthed. Situated just a few minutes away from Dartmouth, you'll discover the magic of Woodlands Adventure Park, a real treat for families or the young at heart. The park has many exciting outdoor activities, enormous water slides, a toboggan run and many indoor and outdoor activity areas for all age groups.